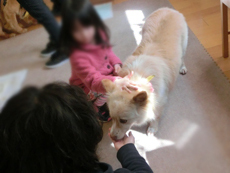 2014.02.26 Adoption Event Report ☆ at GREENDOG on Feb. 23rd (Sun). 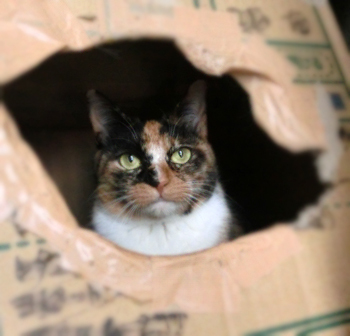 2014.02.20 Don’t you like calicos? 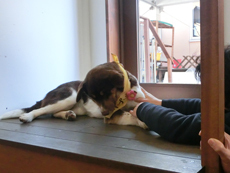 Adoption Event Report ☆ at GREENDOG on Feb. 23rd (Sun). Recently, snow on the sides of our walking courses disappeared at last, and we feel that spring is around corner. Don’t you have itchy eyes…? 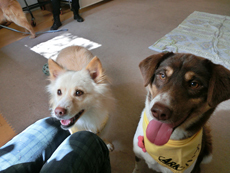 On Feb. 23rd (Sun), a warm day for February, we brought 4 dogs and 2 cats and held an adoption event again thanks to GREEN DOG SQUARE Kobe (Jpn. only)! 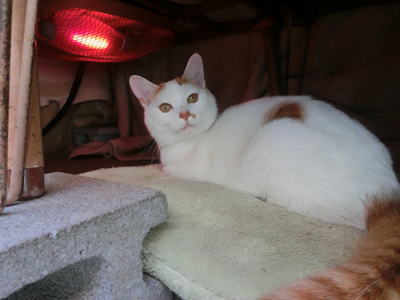 Let’s take a look at 2 cats first since there was no entry on this blog on Cat Day (Feb. 22nd). 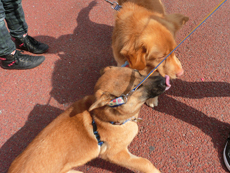 Oshibe and Meshibe, brother and sister, joined the event. The first thing Oshibe, a big eater, did at the venue was to eat. He seemed to have room not only in his stomach but also in his mind so he snuggled against people. Meanwhile, Meshibe seemed nervous and stayed firmly in her dome bed. I was quite convinced that the more kittens grow, the more they become sensitive to changes in their environment. I wish I could show you Meshibe being very sweet at ARK. Kittens grow so fast that we can enjoy “tiny kittens” for just a fraction of a second. 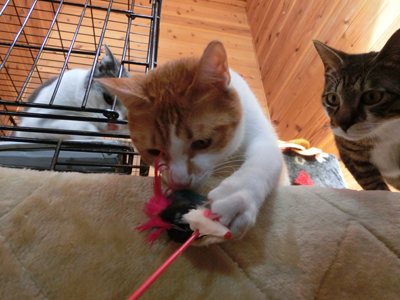 In addition to that, you can see cats’ personalities if you adopt young cats instead of kittens. Anyway, let’s keep our fingers crossed for them to meet their true families. Lets’ move to dogs; the first one is Harp on a toilet sheet. She is becoming a “regular” at adoption events. At adoption events, she comes to people only when she wants food; for the rest of the time, she keeps a “leave me alone” attitude. Yes, she is a type of girl who always goes at her own pace. However, she becomes so happy when someone pets her that she shows her belly. She would be calm at home without making a fuss, so it would be easy for you to have a dog like her. Actually, we had a visitor who came all the way to see Harp this day. Again, on behalf of the dogs from the mountains, we brought Pooka, a chubby cute girl, this day. The other dogs were very skinny when they came to ARK while she was the only dog which was so chubby that we once wondered if she was pregnant. As you may guess, she is a big eater and that is a huge advantage in an adoption event! She was able eat from anybody and everybody. Besides, she was calm and also came to people for affection. 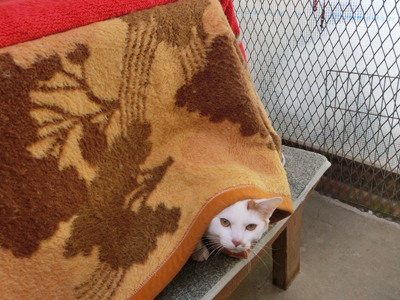 As Aja did at the Dec. event, Pooka was always with people and enjoyed the warmth of the visitors’ hands. She enjoyed a walk outside, although it was a surprise to us (in a good way, of course). She may be the next one after Aja who gets her own home. 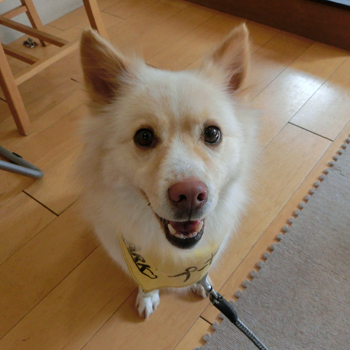 This is a golden retriever-mix, Oboro. 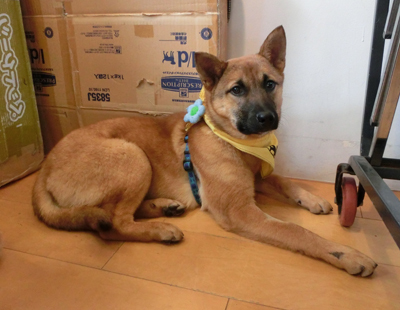 The day before the adoption event, Dan, which may be Oboro’s father, was moved to Tokyo so Oboro seemed to miss him at ARK. However, he enjoyed the adoption event a lot and was playing with the son of a volunteer with a ball throughout the event. Since Dan has not taught him, Oboro is not good at playing with other dogs. He is a type of dog which, even though he loves dogs, mounts and annoys them at the same time. Although he behaves in such a way, he will get back once he understands he annoyed other dogs. 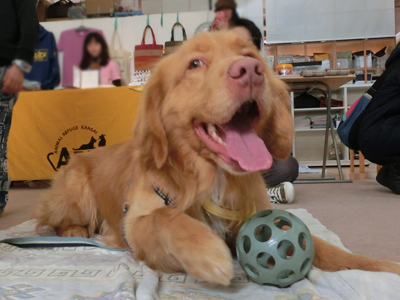 Which means that you can adopt him even if you already have another dog as long as he/she is a “teacher” type of dog! With people? He definitely loves people, literally everyone. He would be good with kids, too. On behalf of team “Mushrooms”, Eringi joined the event. Thanks to a member of the ARK staff who brings him back home every day, he is now ok with cars and even leaps in the car on his own. Anyway, he proved that he is growing day by day. So, we want Oboro to learn from Eringi since he sometimes has a problem of urine leakage. Mushrooms (brown puppies) love dogs very much so they can walk even in an area new to them, as long as they have other dogs’ company. Look at his face on the picture on the right! He was always in a corner during the event because he didn’t know what to do with so many guests, which was too much for him, but became totally happy when Oboro came to him. He would become “a part of a family” very soon if he was adopted by a family with another dog(s). 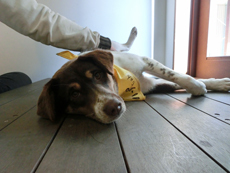 No one could find their own home but several potential adopters visited us on this day! We are looking forward to seeing you in Nose! 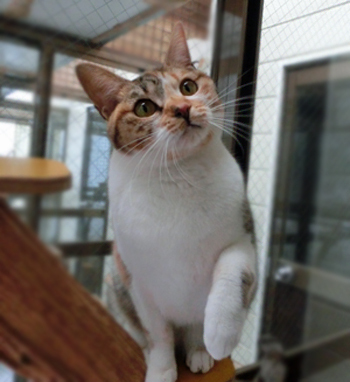 One quick question; don’t you like calico (tricolor) cats? I guess they were once popular. 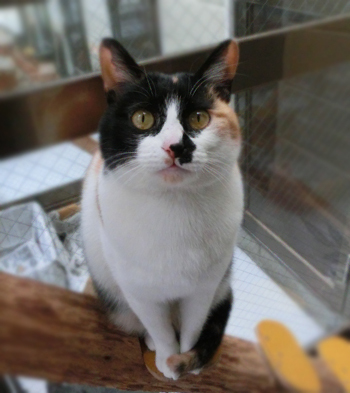 The word “calico” sounded like a Japanese traditional type of cats, with beautiful tricolor patterns. 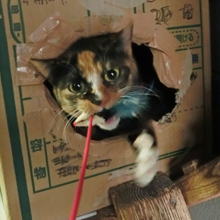 However recently, people often say “Calicos? 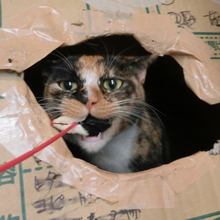 Oh, they must be strong-minded” when we introduce calico cats to potential adopters. Yes, it is somewhat understandable that people say such a thing. They are wise, thus can be sensitive. That may be the reason why they are often considered to be “strong-minded”. But please imagine having a beautiful and really wise cat like them with you; doesn’t it seem nice? 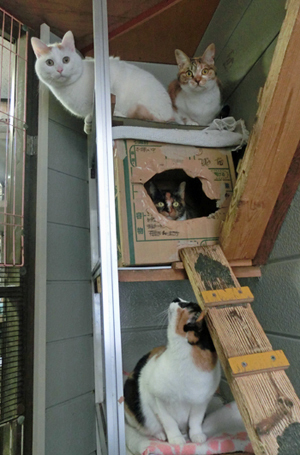 So, today, I would like to introduce you to some of the calico cats at ARK! We have rooms called “Numbers” from No. 1 through 5. In No.1, there are “Basher Tarr and 3 calicos”. That’s why he is with 3 ladies which are all calicos. 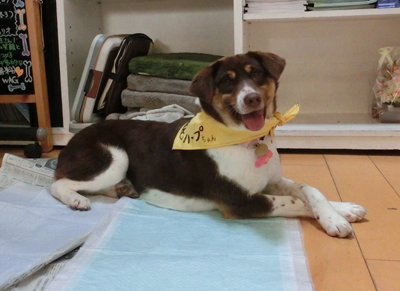 This is Hibari, rescued in front of a station when she was about 2-month old. She was named after the station. She was already calm when she was kitten. She loves people but doesn’t come after people for affection all the time. That may be the reason why such a nice cat like her still waits for her own family. She simply has been failing to appeal enough to visitors. She’s very pretty and besides that, she is not strong-minded. Rather, she is very calm like her softly-colored coat. I hope that she’ll find her own home this year, during which she will turn 2! 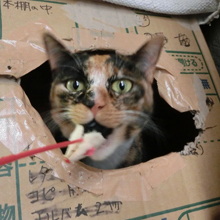 This is Rain, which often sleeps with Hibari in a box. She is as young as Hibari and seems to get along with her very well. Rain came to ARK on a rainy day. She’s been shy and easily scared since she came here. However, she’s never attacked anyone. She can easily be scared, but will get happy if you show her a toy. She sticks her head out of a box like a moray. Isn’t she cute? Lastly, this is Chugger, mother of the “So grown-up” kittens. 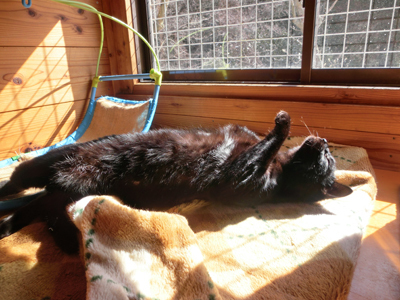 Can you believe that she has experienced giving birth to her kittens? She is such a girly girl spending every minute at her own pace. If you step in the room, she will be the first cat to welcome you and ask for affection. I think it is nice to have a cat which doesn’t come to you all the time and gives you some space occasionally. She takes a powerful stance against other cats so she’ll be happy to be the only cat in the family. So, now you know that we have a lot of good-natured calicos. 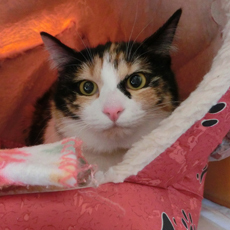 We also have other cute calicos such as Chako, which was once introduced to you in an entry of this blog, or Meshibe, which will turn 1 soon. Please come to see them! 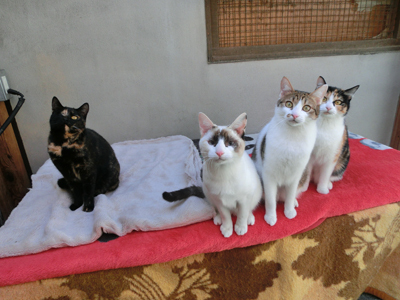 You may remember the 6 shy kittens (brothers and sisters) which we introduced you last July. Now all of them except Wilson, which found his own home as you can see in a comment if the entry (thank you very much, Hana-san! ), are still at ARK. It is little bit difficult for shy animals to be adopted while animals which “come to everyone immediately asking for affection” are good at showing their attractiveness to people and are thus easily adopted. So, these 6 kittens will reach their first birthday this Saturday. Wow, we need to celebrate them being at ARK for a full year… just kidding. 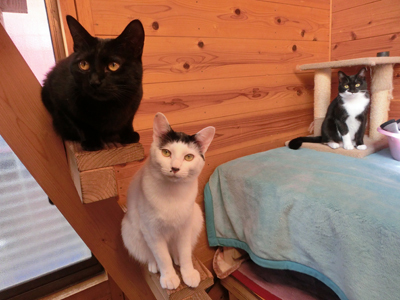 We need to tell you how wonderful they are so that they will be adopted as soon as possible. Let’s take a look at each one of them and see how they have grown into gorgeous cats. 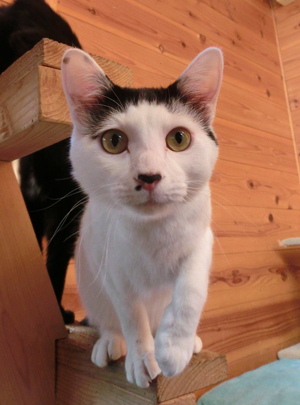 Dunbar, with a distinctive spot beside his nose, now lives with Oshibe and Meshibe, which are brother and sister, Yukata, one of Siamese-mix kittens, and Churasan, a lady with one eye. All of Dunbar’s roommates are the complete opposite of shy so they may give him a good influence. Thank you very much for gathering! If we describe these cats in a word then “active” is the one for the others while “still” is the one for Dunbar. Since we try to save electricity, he grew well-rounded this winter. I know cat lovers can’t resist such a “leave-me-alone” attitude. He acts like this but please watch carefully if you have a cat toy. He will poke his head out of the kotatsu! 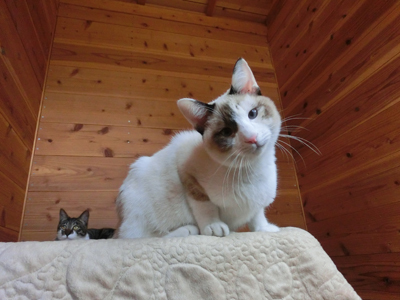 Pete, a brown-and-white cat, now lives with Happi, Branco, and Uminchu, who is going to go to his own home soon. 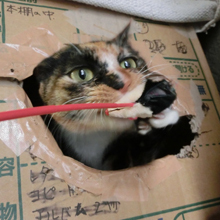 He is a careful type of cat who starts playing with toys after thinking about it for a while. 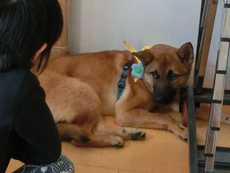 The opposite is Uminchu, who instantly jumps at toys and even climbs on the person who holds it in order to get it. (That’s why Uminchu was asked to stay in a cage during the photo shooting). Pete will show reluctance for a second if you hold him though he will gradually relax and get comfortable if you keep petting him. 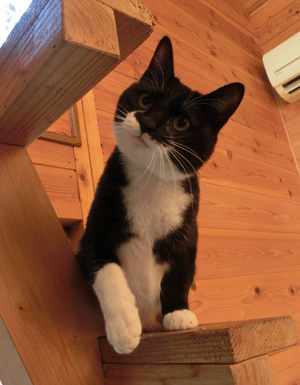 He may be the type of cat which asks for affection only from his own family. Taking this opportunity, let us introduce a beauty, Happi, too. 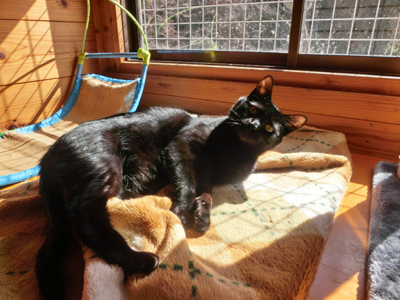 The other 4 cats are now with an incredibly-friendly cat, Blacky. From left: Emery, Action Chugger, and Harrison. He will not come immediately to you but actually loves people. He may quietly purrs or show his belly on the floor. Anyway, he is one of the cutest slow-tempo cats at ARK. Please come to see him and point your camera at him! Harrison always loves toys. He is also a cat full of attractiveness, with a batman-like pattern on his face and a pair of white socks irregular in length. He is looking forward to finding his own family who will play with him a lot! 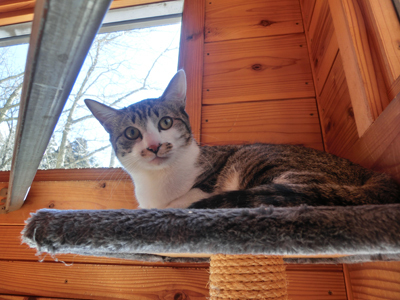 Emery, a very friendly girl, still waits for her own home. 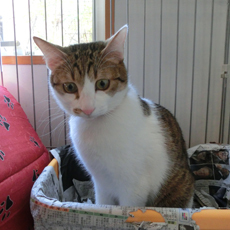 She could have been adopted soon after she joined ARK because of her friendliness, so I guess she may keep in steps with her siblings. … praying that I wouldn’t notice him at the top of a cat tower. You know that won’t happen, sweetie. The best gift for them for their first birthday will definitely to get a home of their own. You may be the one who will offer them that greatest gift of all! 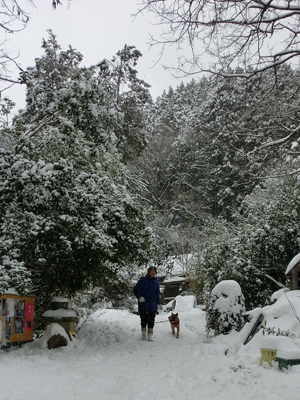 I guess it’s snowing across Japan today. As you may guess, ARK is covered by snow today. 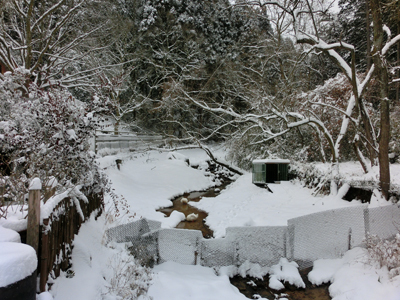 Due to milder winters, we haven’t had much snow in recent years. Oh, your paws are really cold, Sette. 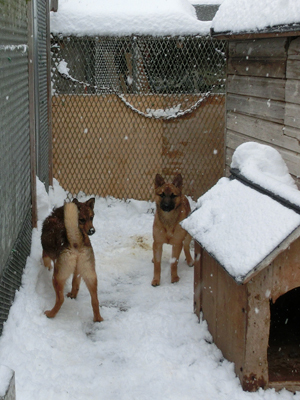 Eringi and Enoki, the brown mushroom puppies, enjoyed the snow a lot. 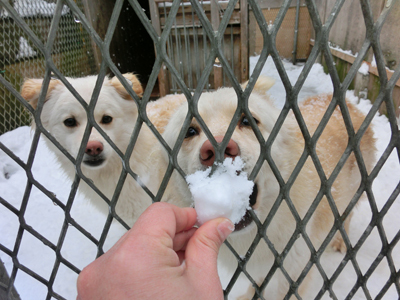 The dog eating snow is Soraya and the other one looking at her is Phaedra. 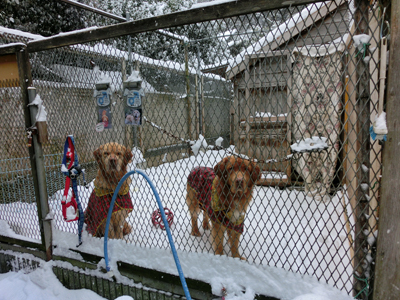 They always look white but against the white snow I remember they are really beige dogs. Look at her! She is Gacchan. 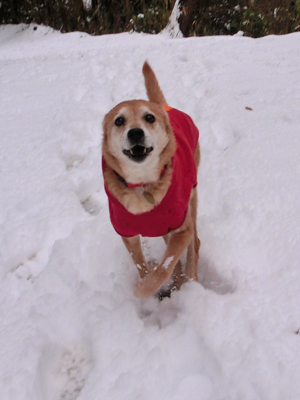 She will be 14 years old this year and is so happy in the snow! The duck couple swim as usual even if it snows. 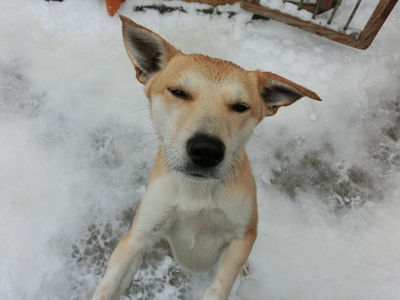 Although it snowed heavily across the country, 2 animals left ARK for their forever homes. We do appreciate people who came all this way to ARK on a day like this. February is the month when we see the fewest visitors. However, it rarely snows here in Nose and on most days we drive to/from ARK in February without any problem. So, thank you very much for visiting us!